Well friends, we are just two days out from September now and that means fall decor is almost in full swing. Can you believe it? It seems like this summer just flew by, right? I’m definitely sad it’s already over, but it’s time to embrace the new season and all the lovely things that come with fall. 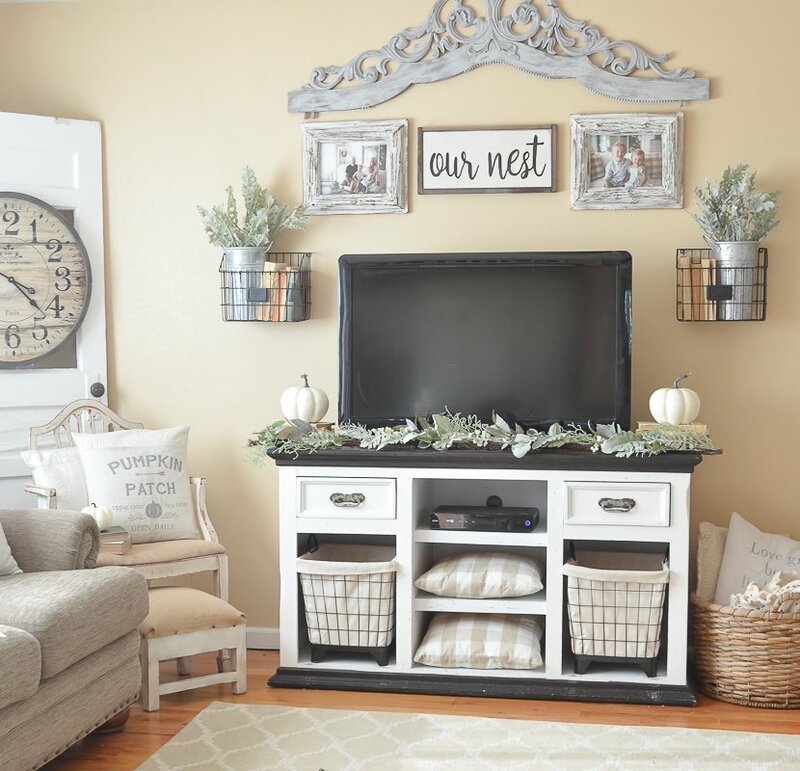 I know many of you are starting to transition your home from summer to fall decor, so today I want to share some simple tips to decorate for fall on a budget. Now, you guys know I’m all about simplicity when it comes to my decor. I tend to keep things pretty low-key around here, but this is especially true when it comes to seasonal decor. Call me crazy, but I don’t think you should run out to buy all the things and completely re-decorate your home from one season to the next–that’s definitely not what I do. It’s just not practical for the budget and it’s simply not realistic for the majority of us. I have a minimalist approach when it comes to seasonal decor, so today I’m going to share 3 simple tips to decorate for fall on a budget. These are simply things I do to decorate our home beautifully from one season to the next without breaking the bank. Or going crazy in the process. I actually just styled part of our living room for fall, so I’ll show you how I did it using the simple tips I’m sharing today. A lot like a capsule wardrobe, where you invest in staple pieces that will last a long time, I think of decorating for the seasons in the same way. Really it’s simply about investing in items that you know you will love for years to come. That’s the key. For fall, I focus on buying only what I know will last me many years and never go out of style–neutral colored pumpkins, beautiful and classy throw pillows, and seasonal greenery like wreaths and garland. Creating a collection of items you know you’ll love from year to year will save you loads of money in the long run. I styled up this corner of our living room using just the simple basics–white pumpkins, greenery, and a seasonal pillow. 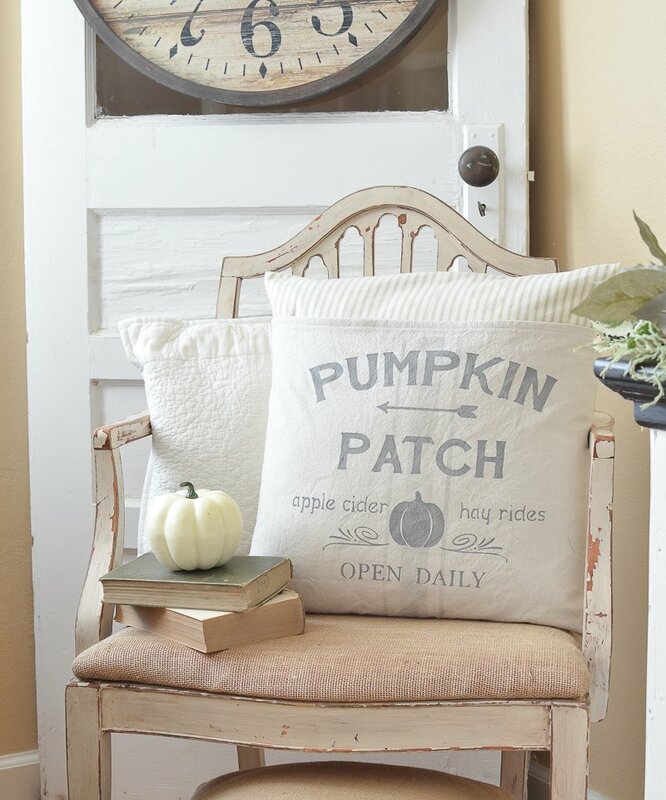 This gorgeous fall pillow is one thing I know I will love for many, many years to come. Isn’t it so unique with that ticking stripe fabric on top?! It’s not only well-made and sure to last a long time, but it also perfectly blends in with the rest of my decor. 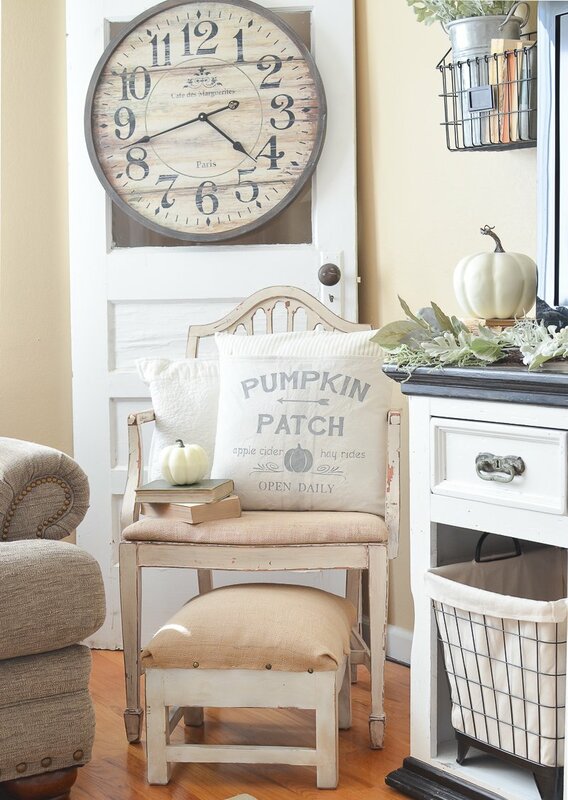 Investing in a few seasonal pillows like this one makes decorating for fall effortless and simple. I don’t know about you guys, but I’m always on the hunt of for a good coupon or discount codes. I tend to buy the majority of my seasonal greenery and faux pumpkins at Michael’s, so I always make sure to stay up to date on their sales. I NEVER buy anything at full price and I usually only go when I have a coupon for an extra discount off my entire purchase. 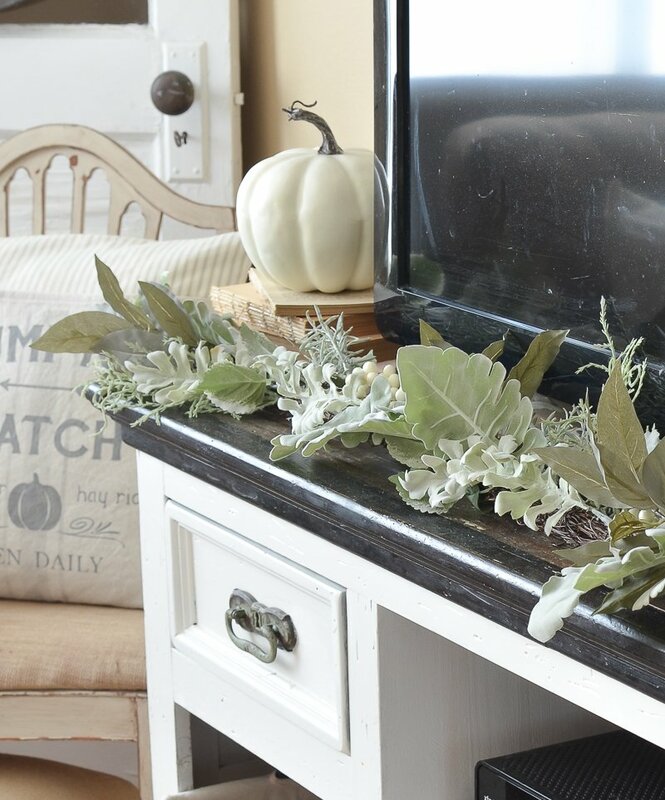 That savings really adds up and allows me to get great stuff, like this fall garland on top of our tv stand, at a super cheap price. Get on your favorite store’s mailing list and don’t be shy about using those coupons! I have to tell you guys a quick story with this one. So a few months back I went to an estate sale at this gorgeous house that was about three times the size of my home. I was so excited to find a treasure or two, but when I got inside the house I was overwhelmed. I have honestly never seen so much stuff crammed into one house in my entire life. It was absolutely crazy. Every room was overflowing with piles and piles–it was borderline hoarder status. And you want to know what most of the stuff was? HOLIDAY DECOR. There were mounds and mounds of knick-knack fall decor, Easter decor, Halloween decor, Christmas decor, etc. You name it, it was there. I honestly wish I had snapped a photo to show you guys just how insane it was, but I was in too much shock. 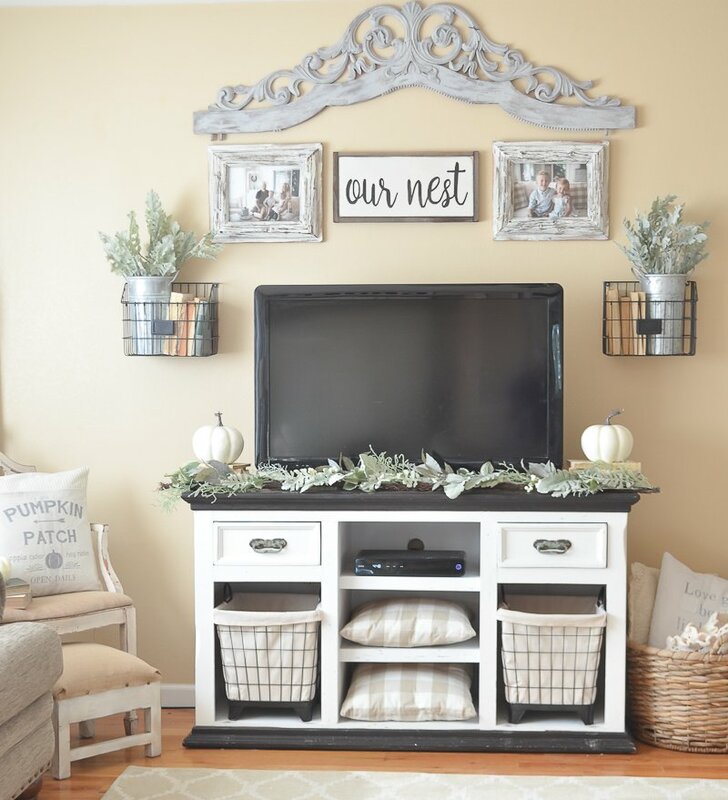 And this brings me to my next point–if you’re on a budget and looking to keep things simple, don’t waste tons of money on seasonal knick-knacks and “cutesy” type decor. My strategy is to stick to the basics, because chances are good that I won’t love that cute wooden bear holding the bright orange pumpkin again next fall. I only buy what I am head over heels in love with it and absolutely positive I’ll use again next year and the year after that. This simple concept really saves you so much money. If not, you’ll just start accumulating so much stuff you that you’ll end up like the hoarder. Don’t be like the hoader! I hope these three simple tips have shown you how easy it can be to decorate for fall on a budget. Or any season for that matter. Don’t believe the hype that you have to buy all the things and re-do all your decor every few months. It just ain’t good for the wallet. Or your sanity. Instead, my strategy is to focus on building a basic and simple collection of seasonal decor I know I will love for a long time and things that will blend easily into my home. 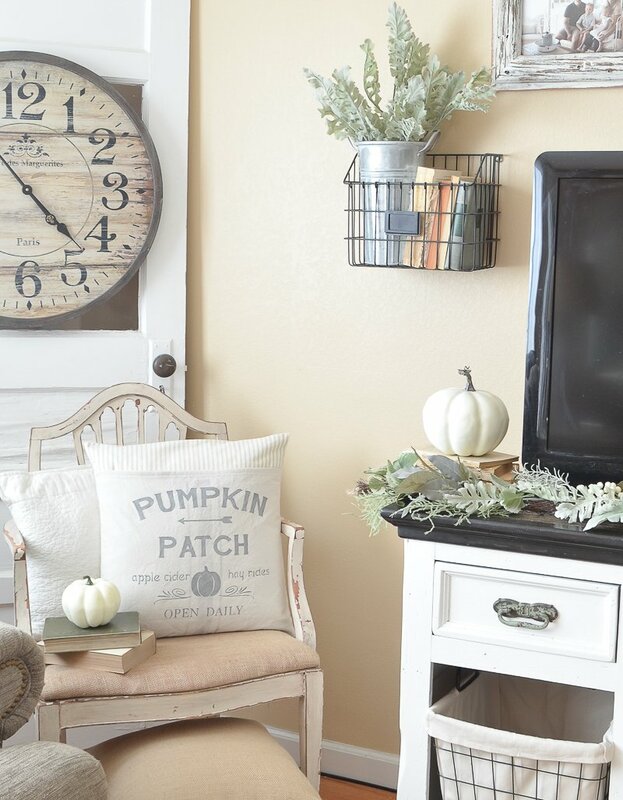 Like this area in our living room–it really only took about fifteen minutes to transition it into fall thanks to a few basic items like the pillow, greenery and a couple white pumpkins. Easy peasy. And I’ll tell ya, having those things ready to roll from year to year really takes all the stress out of decorating for each new season. I don’t have boxes upon boxes of seasonal decor to sort through–it’s just a small collection of things I love, which really saves me so much money in the long run. 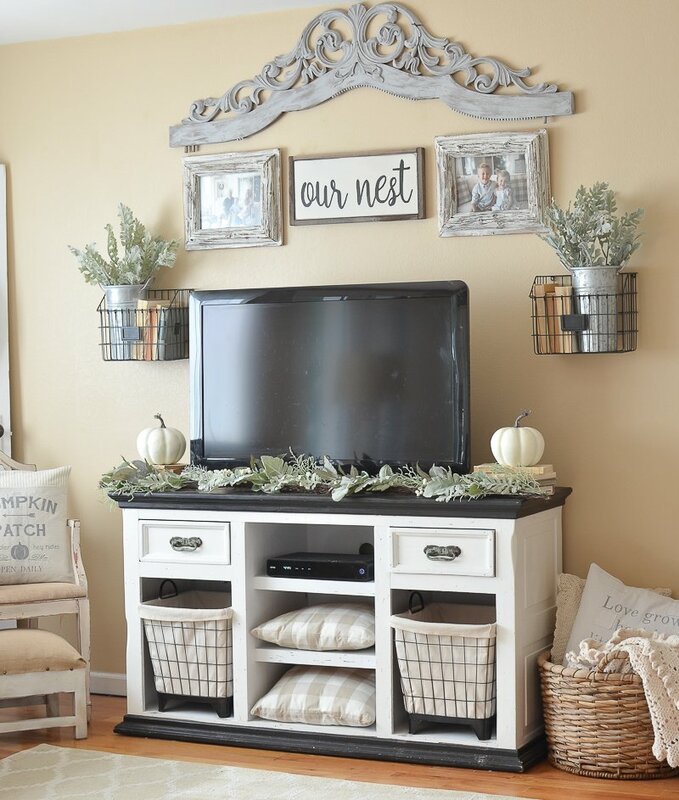 Love your fall decorating! Easy and pretty. Making a trip to Michaels today. They have some great sales going on! Thanks for the tips. Yes! Michael’s! I scored some great stuff and savings today! 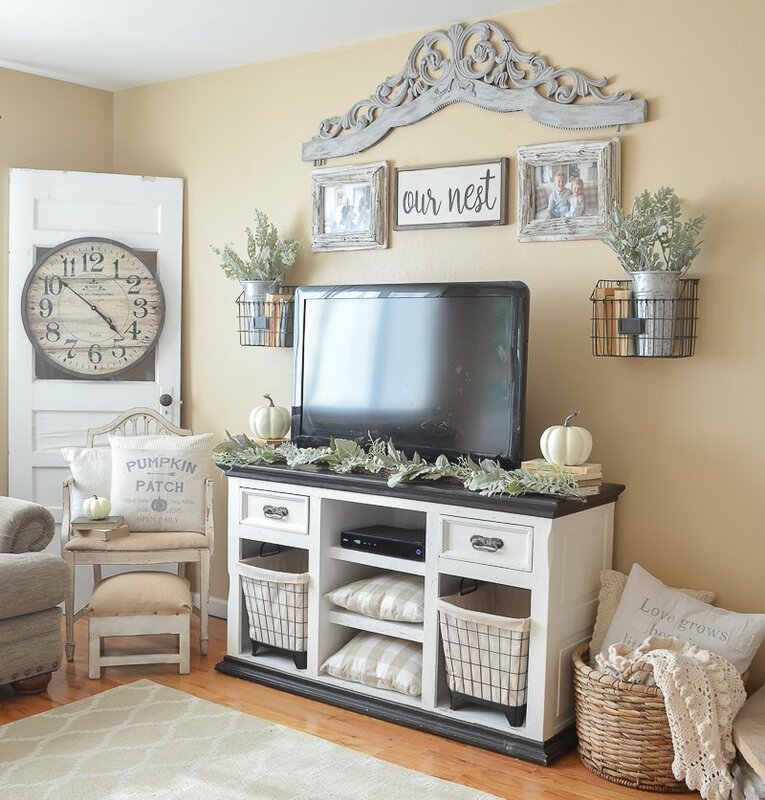 I love the way you decorated your living room and love the tips for keeping it simple and easy. Loved your estate sale story….too funny! 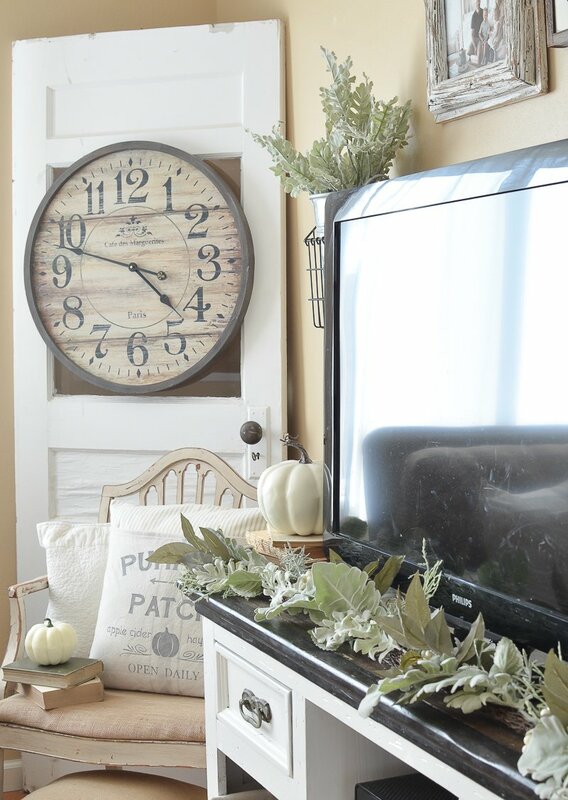 I love these tips for Fall Decorating! This weekend, I’m going to go digging in my garage and find my little box of Fall! I tend to get tempted into buying those little cutesy seasonal decorations because I think “hey, my house is small…this will fit” when in the long run all of those little things add up and make things look cluttered, which is the opposite of what I was going for. I’m really going to be focusing on keeping thing simple this Fall and Holiday season! Thanks for your tips friend. Fantastic, gorgeous, beautiful space. I love it! I get tempted by those things too Chelsea. But I got rid of so much of it last year and I promised myself no more spending on little things I didn’t love! Your fall house is looking awesome! 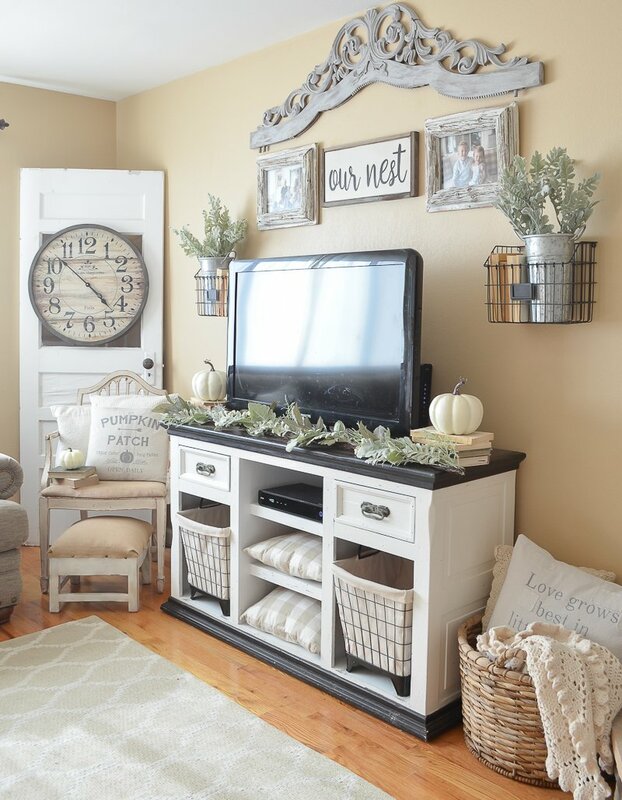 I just love the neutral decor….especially the pillows. Thanks for the tips. Love the “our nest” sign! Just ordered one from etsy! One thing I try to do at each holiday that has a season vs one day is save some money for post holiday sales…I too buy only what I love on sale, but I always visit the 70% off section afterwards…there’s usually something to keep me excited and looking forward to decorating next year….I didn’t realize for a long time that you can use several coupons on one visit at Joanns…Your house looks so cute…you do a great job…I love all the neutrals you use…simple things…it looks lovely! That’s a great idea Faith, I should have mentioned those awesome post-holiday sales. I definitely hit those up too! I live in a small apartment and HAVE to be minimal with seasonal stuff because of limited storage. I have things for each season but ONLY the things I love and not clutter. I have asked family not to give me decor for gifts. For fall, I have a big owl pillow I LOVE and have had for about 8 years. I have two pumpkin pillow covers. I have a pretty tablerunner with pumpkins. I have a owl straw figure and a small turkey, plus i painted a turkey painting myself. That is IT. I don’t want anything else. Lol! The color scheme just “adds” the orange in the two pillows, and the other stuff goes with what the space already has in it for colors. Some people change out all the colors and slipcovers and whatnot, but I can’t afford it or store it. I was wondering if you could tell me the paint color of your walls in this post? It’s such a beautiful soft neutral color! Hi Tatyana, It’s Autumn Blonde by Sherwin Williams. I enjoy reading your posts and love all the ideas you give about decorating. I have a question about your drop cloth curtains, I bought some and they were all different lengths. I was hoping to just be able to hang them but was not able to do that. Did you run into that problem when you got yours? Oh no! I never ran into that problem, they should all measure the exact same. Where did you buy them? I very much love your ideas! I completely agree on not buying small items as they would just make your design look tacky and collect extra dust. ?I’d like to try these at home and I’d let you know how it turns out. Thank you so much! Woww Sarah! Everything is looking just so perfect in your post. I enjoyed reading it throughout. 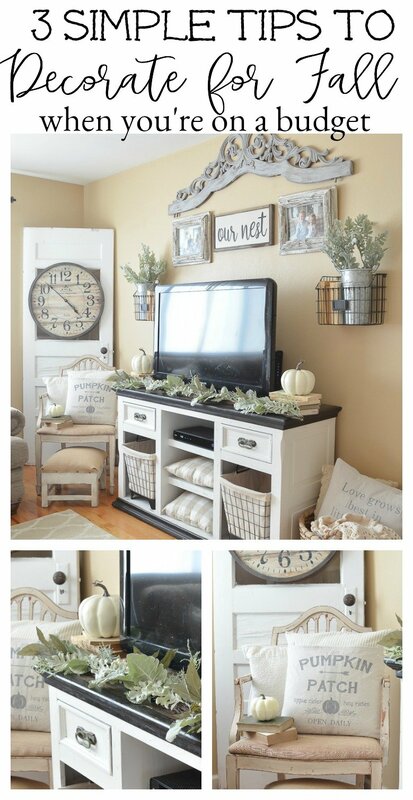 The use of neutral colors which you have done is really pretty awesome. I liked the way you used the pillow decor in the picture since it really does feel comfortable. It was also nice when you said that it perfectly fits the decor style because I can agree with you. It might be a good idea to use that kind of pillow for my own fall decor. I’ll go for white though since I already used beige on the walls. Thank you for the idea!